OC Automedics is your trusted auto repair shop in Rancho Santa Margarita for any Head Gasket Repairs. Your car’s head gasket is located between the engine block and the piston cylinder head. It seals the combustion process that occurs in the piston chamber. The head gasket also keeps the coolant and oil inside your engine from mixing together. A blown head gasket can cause your engine to lose power and completely malfunction. If you need blown head gasket replacement or repair in Rancho Santa Margarita, then visit our auto shop or give us a call! Engine overheating is generally the main cause of head gasket failure. When your engine overheats, the engine head and block expand which damages the head gasket. 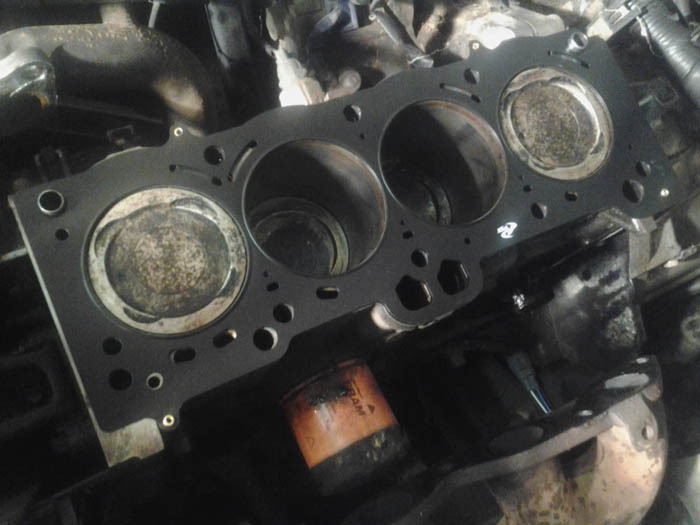 Due to the head gasket sitting in between the engine block and cylinder head, head gasket replacement is a tedious procedure that requires the skills of a professional or experienced mechanic. Our ASE certified and fully-trained mechanics provide expert head gasket repair service in Phoenix. For head gasket replacement that is both affordable and properly done, bring your vehicle to OC Automedics. We utilize only the best replacement parts and back our repair services with our 24 month / 24,000 mile warranty. For the best auto service in Rancho Santa Margarita, give us a call. We look forward to serving you! How To Recognize If Your Car Has Head Gasket Issues? Does your car have a blown head gasket? White smoke coming out of your car’s tailpipe? Is there water in your car’s oil? Is your vehicle idling rough? Is there backpressure or bubbling in your car’s radiator? External leaks and leaking freeze plugs? If you notice any of these signs, you need a head gasket repair sealant! These are all classic symptoms of a damaged head gasket. Ignoring these symptoms can lead to a costly repair bill. A blown head gasket in Rancho Santa Margarita can be a costly repair any way you look at it, but there are some ways to make sure you get the most value out of your repair. The head gasket repair first thing to do is to make sure the diagnosis is correct. Then, find a reputable auto repair shop to handle the repair, preferably one that has a lot of experience in engine rebuilds and head gasket repair. Then, with the tips following, be sure to ask a few key questions to make sure the repair is done correctly. The diagnosis can be a little tricky depending on how bad the head gasket is. If it is beginning to fail, the signs will be moderate, and will typically be a slight overheating, or a small amount of white smoke coming from the exhaust. If the gasket is completely gone, it will be obvious due to the rough idle, or it wont run at all. If it does run, there will be a large amount of white smoke coming from the exhaust. If the head gasket blows while driving, the biggest thing to watch out for is the temperature. Higher temps can quickly damage an engine by causing warping of the heads or the block, or even cracking. The sooner the engine is stopped after realizing the head gasket is blown, the better the chances of rebuilding the top end without major consequences. “OC Automedics” is Your Friendly Auto Repair Shop For Head Gasket Repair in Rancho Santa MArgarita, California.